BEAUFORT – The dibble slices the sand like butter. Working in pairs, one volunteer wedges a hole into the island shore and the other plugs it with a native marsh plant, spartina alterniflora. Several organizations and volunteers spend the afternoon planting the shoreline in a joint effort to stabilize the rapidly eroding southeast edge of Carrot Island near Beaufort. Three thousand five hundred plants later, a green shoreline runs parallel to the North River channel. The marsh planting is the island’s last line of defense against boat wakes, storms and sea-level rise. Carrot Island is one of five islands that make up the Rachel Carson Reserve across from Beaufort’s harbor. It’s an ideal site for a shoreline stabilization project because of its high erosion rate and its public visibility. The national and state reserve programs protect areas like the Rachel Carson Reserve for research, education and public stewardship opportunities. Aside from thwarting erosion, the marsh planting is also a demonstration for private property owners who might be thinking about how they want to stabilize their own shoreline. It is part of a bigger effort funded by the National Ocean and Atmospheric Administration, or NOAA, to compare natural shoreline stabilization and bulkheads along the N.C. coast. The oyster reefs seaward of the marsh plants are the island’s first line of dense against erosion. The combination of reefs and plants makes a living shoreline, a natural approach that controls erosion, creates habitat for marine animals and improves water quality by filtering particles and sediment. This living shoreline project on Carrot Island is somewhat experimental. 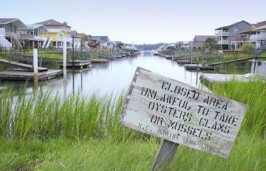 The research reserve contracted with UNC’s Institute of Marine Sciences in 2012 to build oyster reefs by essentially dumping loose oyster shells along the shoreline. With boat wakes and waves pulverizing the shoreline, the researchers weren’t sure if oyster larvae, or spat, would attach to those loose shells in time to solidify them into a reef. Now there is a reef with living oysters on top of what was, two years ago, a pile of oyster shells. And the width of the beach is noticeably wider behind the oyster reefs than the shoreline without a structural barrier. “Today we’re just going to enhance the area with plants; so that’s going to stabilize the soil further, help the soil to accrete even more and provide some habitat to small critters,” said Paula Gillikin, the central sites manager for the research reserve. The saltmarsh cordgrass will grow roots two to three times longer than the green stems that sprout above ground, according to Currin. This holds the soil together. The stems also play an important role. “The above-ground biomass is important because that’s what knocks down the waves. As it reduces wave energy, sediment falls out and then we build up the surface of the marsh,” said Currin. The plants, especially the oysters, help to filter the water. They also become a lush haven for crabs and juvenile fish hiding from predators in the open water. “Probably by this time next year there’ll be lots of fiddler crabs that aren’t here today,” said Lexia Weaver, a coastal scientist for the N.C. Coastal Federation, who partnered with the others to help guide the marsh planting. “So you have the habitat, the filtering and the erosion control all in one restoration project,” Weaver said. “This is our big effort to really try to stabilize this. We hope that as people come out they’ll see this great way to stabilize a shoreline without a bulkhead,” Currin said, as kayakers and boaters cruised by in the background. Bulkheads or seawalls, by comparison, are usually concrete, wood or vinyl walls at a property’s edge that slow erosion and protect what’s behind them. Like a cliff it has a steep drop-off, which forms when the wave energy, that has nowhere to go, scours the sand and tears apart any marsh. It’s a barren place for marine animals. Forget filtering water. They can be more expensive to build and maintain than a living shoreline and they don’t necessarily hold up better in a big storm, according to Gittman. After Hurricane Irene hit, Gittman traveled up the N.C. coast to conduct a visual assessment of the damage to different types of stabilized shorelines. “What we found was that bulkheads by far had the most damage,” she said. The storm hit at high tide. Water came up over the bulkheads, scoured behind them and caused them to collapse. Whereas water ran up and down the alternatives with low slopes. “We had lots of property damage because people had bulk headed shorelines that were not mimicking the natural slope of the shoreline,” Gittman said. “I do think it provides some evidence that at least when comparing to natural shorelines, damage when a bulkhead does fail is much more substantial than a little bit of erosion you may see along a natural marsh and much more expensive to repair,” said Gittman.